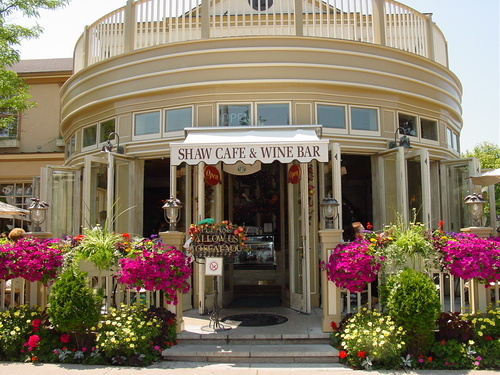 Since opening in 1996, the Shaw Cafe & Wine Bar has served delicious food and wine with the flare of a European cafe. Its cuisine is sure to satisfy the discriminating tastes of our local and international guests. The Shaw Cafe menu is created for the pallets of all walks of life. From our children's menu to our exciting all day full menu, there is something for every one. Enjoy dining on the flower-filled outdoor patio, or come inside to the rotunda. Enjoy a select Canadian cheeses plate or our house made hummus with crispy bread. They will tickle your tastebuds especially if complemented with a glass of Niagara wine. Our return guests come back for our signature Turkey Club or Ham and Brie sandwich. For a nice romantic dinner, try our Roasted Pork Tenderloin or Rib Eye Steak paired with a bottle of carefully selected Niagara wine and much more. We work closely with local growers to ensure the freshest produce on each dish. We are excited to share our culinary experiences with both locals and visitors in the beautiful town of Niagara-on-the-Lake. Find us in the heart of Old Towne at 92 Queen Street.